Ingeniously designed by Mark Bell. This new design features a thumb loop that is sewn flat to the wrap. This feature allows the wrap to be used a number of different ways that traditional wraps cannot. The material of this wrap allows for greater compression than standard elbow and knee sleeves. Wrap your wrist, elbows or knees. 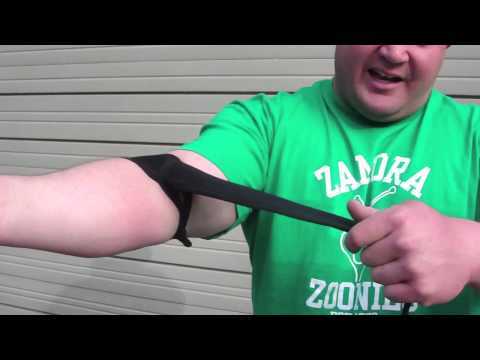 Sling Shot Multipurpose Wraps is rated 5.0 out of 5 by 4. Rated 5 out of 5 by reaper from Great product After using many other brand name wraps in which always started to break down over time and as poundages went up most other wraps did not provide the best support especially on the bench where they are the only thing keeping your wrists from injury other wraps the velcro would ware out or the stiching would become loose and the velcro would fall off completely plus the materials used were sub standard but not with these wraps they not only support my wrists better the material used is high quality and the velcro is double stitched so it will take longer before they ware down awesome product mark bell does not put out bad products these are great and i recommend them to anybody serious about lifting big weights. Rated 5 out of 5 by Roberto from Awesome wraps Got there about a year ago and they have held up really well. The 26" wraps provide a ton of support (I can't even imagine the 42" ones...). You feel rock solid in these things. These have been durable, supportive and comfortable.